Silverline Tools established for over 30 years, are a leading industry expert in the manufacture and supply of hand and power tools. Recognized and trusted throughout the UK and Europe, our management team and technicians are constantly striving to ensure Silverline tools meet and surpass all your DIY requirements again and again. Offering a comprehensive and carefully selected range of products, we are dedicated to meeting current and future demands and are constantly evolving to ensure you get the very latest tools using up-to-date, cutting edge technology. Silverline Tools seem like they have been around since the invention of the wheel. Silverline Tools trusted in the trade. Oil free air compressor. Aluminium single cylinder head with cast iron cylinder gives added resistance to wear. This 24L compressor is suitable for general-purpose workshop applications. Suitable for most common air tools. Incorporates tank and pressure outlet gauges, pressure relief safety valve and pressure regulator. Supplied with PCL and European air line fittings. 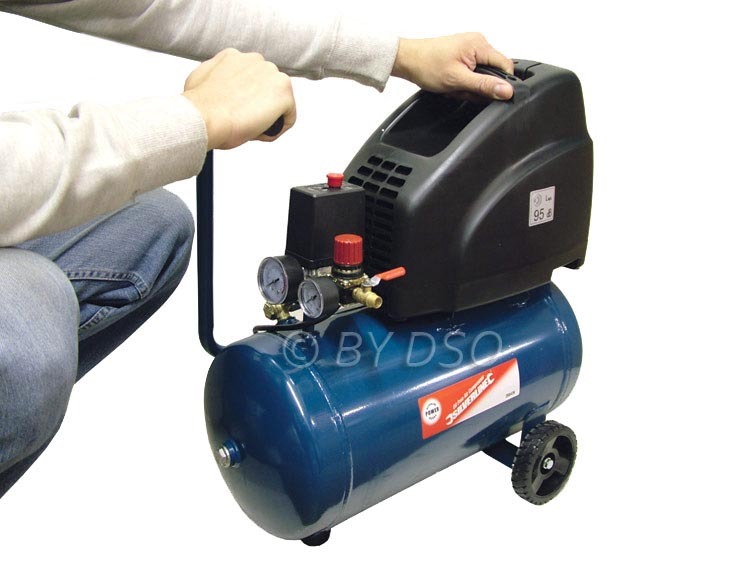 Being oiless you get dependable clean air all the time as long as you drain the compressor of any moisture that may have built up inside the tank. Great for use with spray guns that cannot have any addition oil mixed with paint. Even though this compressor will need to be maintained to keep it at optimal performance the oilless compressors use components that don't require external lubrication. Welded tank complies with latest European standards. All fitted with twin gauges displaying tank and working pressures. Silverline Tools, trusted in the trade.